The subprime consumer sector has come a long way since the dark days of the financial crisis. 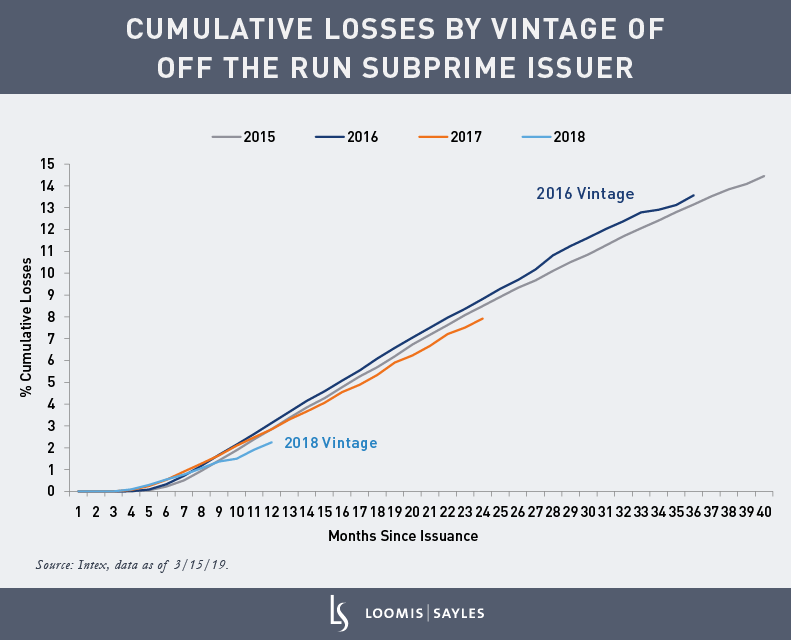 Borrowers, lenders and issuers have made improvements, but still subprime can’t seem to exorcise its reputational demons. I’ve seen a lot of news coverage recently that reinforces investors’ worst fears. Several articles have warned that consumer debt and loan delinquencies are rising, particularly in the auto space. But this doesn’t mean a crisis is brewing. Delinquencies and losses are only part of the story for subprime autos. My analysis of borrowers, lenders and auto asset-backed securities (ABS) deals indicates the subprime auto sector is in better shape than it gets credit for. Let’s see why. Subprime borrowers tend to be lower-income earners. For this group, wage gains usually don’t materialize until late in the economic cycle. This has certainly been the case with the current cycle. A decade into the recovery, lower-income groups are only now enjoying strong income growth. But higher wages are worth the wait. Recent earnings relative to expenditures can have an impact on borrowers’ payment and default behavior. 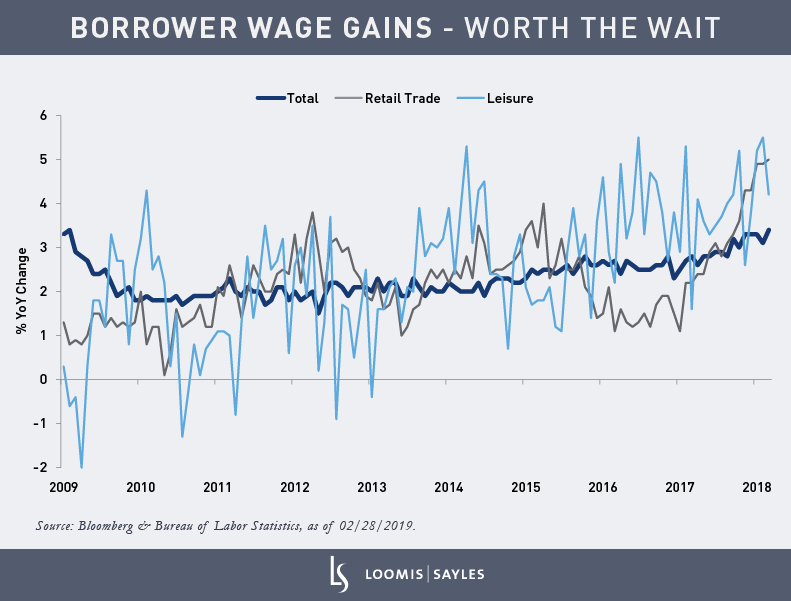 And compared to other workers, wage increases are especially meaningful for subprime borrowers, many of whom live paycheck to paycheck. The chart below illustrates the late-recovery bounce in wages for retail workers (a proxy for lower-income earners). Borrowers aren’t the only group that influences loan performance. Lender and issuer trends vary throughout the economic cycle, which can affect credit patterns. But these aspects of subprime auto ABS get much less attention than the consumer angle. In the middle of the cycle, as the benefits of monetary stimulus spread, lenders tend to “broaden the credit box.” This means extending capital to non-prime borrowers. For the current cycle, this happened from 2015 into the first half of 2017. As the share of higher-risk borrowers grows, increased delinquencies and losses typically follow with a lag, which we saw in 2017 and 2018. This latest rise in delinquencies and losses got plenty of media coverage. What got almost no attention were efforts by lenders to account for higher anticipated defaults and delinquencies. As the credit cycle matures, subprime lenders adopt more conservative underwriting practices. These lenders are credit specialists who price loans (by setting appropriate interest rates) to reflect late-cycle risks and cover anticipated future losses. Asset-backed securities themselves also prepare for expected negative events with high levels of credit support. This includes measures like excess spread—or the difference between the interest an ABS deal takes in and what it pays out to investors. For ABS investors, this extra capital is the first line of defense against losses. Though headlines focus on the downside, auto loan quality is actually up on the whole. The Federal Reserve has commented on this, saying: “… the overall auto loan stock is the highest quality that we have observed since our data began in 2000.” That said, I am always watching for risks. Right now, I am monitoring how pressures like rising rents and healthcare costs could affect subprime borrowers over time. The chart below sums up subprime ABS throughout the cycle. It shows the impact of prior changes in underwriting practices (first loosening credit from 2015 through early 2017, and then tightening credit) and the recent benefits of stronger income growth among subprime borrowers. In fact, as wages rise, losses for the 2016-2017 vintages and recent ABS deals are improving. The shift to more conservative underwriting also appears to be underway, and I believe this will meaningfully impact future delinquency and ABS credit performance. It’s important to remember that subprime lending has not always had a negative image. It was originally heralded as the “democratization of credit,” extending capital to a new demographic of borrowers. But a broader borrower base brings with it more delinquencies and defaults. When the statistics look scary, investors shouldn’t lose sight of fundamentals. I think borrower health, and lender and issuer behavior are a much better yardstick for investors trying to determine how subprime auto ABS measures up.